In other shocking news, the world is round, the sky is blue, and the oceans contain water. Who didn't see this falling apart? Just saw the first ad for "Rush". Says in theaters Sept 27. That movie will be AWESOME! Should we start a 2014 F1 Season thread? A statement from Ferrari read: "Scuderia Ferrari announces that it has reached an agreement with Kimi Raikkonen. The Finn will join Fernando Alonso in the driver line-up for the next two racing seasons." So . . . how long will Fred stay at the Prancing Horse or will Kimi make it through two seasons? A little bitter sweet to see Massa leave. He's been a good team mate in that he does exactly what the team asks of him despite them giving him the short end of the stick consistently, but at the same time his driving hasn't recovered to his pre-accident level after several seasons. 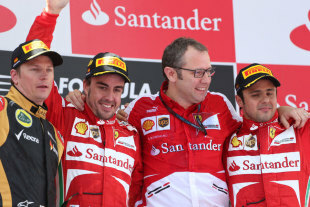 I'm glad to see two front runners at Ferrari for next season, but I really wish Massa had it in him to win one every once in a while to stay there. Hope he finds a good seat somewhere else. If this is true Adrian may have cemented his legacy even further. . . . Pretty much. It's becoming pretty obvious that they've got some huge advantage over everyone else. You just can't open up gaps like that normally. It's going to be interesting to see how long it takes the field to catch up. It's early yet, but this smells like one of those multi-year advantages that leads to a lot of shuffling down the road. could be, but remember the cars will be a good bit different next year, and since they've gotten wind of this, it may be rather quick that FOM makes their system illegal. I would think a work around of an illegal method is still illegal. So far all you have is an internet rumor. The fact is every single time Vettel wins his car is torn apart and inspected by the FIA. Everything on the car from nose to tail is inspected. IF he has some magic form of traction control it's using a method that is legal and the FIA accepts. But in reality I suspect the answer is much more simple. The Red Bull is simply far better than people expected and Vettel has been sandbagging most of the year to protect his tires rather than running at full speed and showing the world what the car can really do. That changed in Singapore where he was told to go ahead and use up the tires and go as fast as he could. Last edited by Moustang; 10/11/13 at 01:59 PM. I was referring to the statement 'traction control' is outlawed. So regardless of the device or method, if controlling traction is outlawed, wouldn't a work around make it illegal? Indeed! I thought I noticed something different about the sound. Technically it would, and the cars are heavily inspected to make sure they don't. Every time Vettel wins his car is taken apart and inspected. A full traction control system is not something you can hide, especially if you cannot use the engine, ECU, engine mapping, or gearbox to do it. It would require a lot of dedicated hardware and a separate computer which would be impossible to hide. As for the "difference in sound" the only thing you are hearing is the difference of a single F1 car going through the corner vs the sound of multiple F1 cars going through the corner. You don't hear the low end grunt with multiple cars because other cars are on throttle and louder. You simply can't hear it as well. You're also trying to compare a Renault engine with Ferrari and Mercedes which sound different because the are different. And here's the kicker. Vettel just qualified second without Kers. If this magical, hidden, super secret traction control system really does use Kers then it wasn't working either. Yet Vettel still qualified second, just .174 slower than Webber who was driving an identical car with a working Kers system. Kinda hard to prove the Kers-based traction control system if the car can still qualify second without Kers, especially when every other car had a working Kers system.